Working at the coalface to combat homelessness and help communities for most of his life, one priest is determined to help those suffering as a result of Ireland’s insidious housing crisis. Currently focusing on housing families, Fr Patsy Carolan OMI has been helping vulnerable people in whatever community he finds himself in, from Birmingham to Dublin. 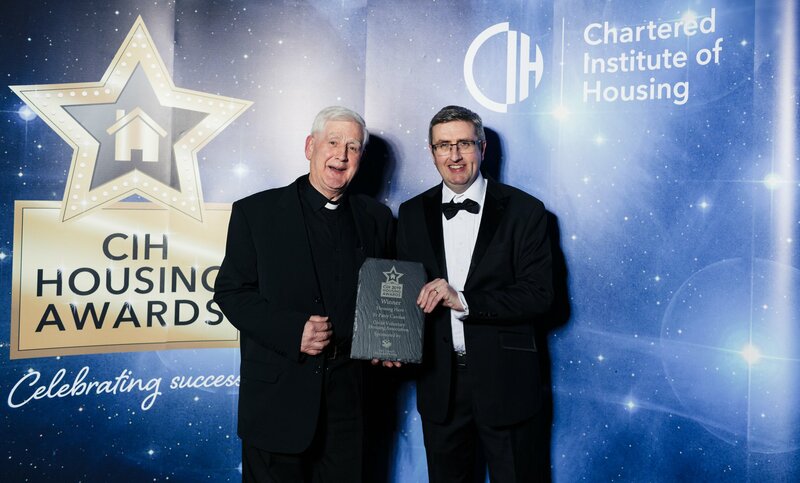 At the end of February he became the first priest to win the All Island Chartered Institute of Housing Aware for Housing Hero 2019 in Belfast for his dedication and commitment to housing in the UK and Ireland for more than half a century. Fr Patsy (80) doesn’t seem to be slowing down in his battle against depravation and poverty. In his community in Inchicore, Co. Dublin he is on the board of two schools, the chairperson of the basketball club, chairperson of the community employment group and on the board of a drug rehabilitation initiative. Still facing down the issue of affordable housing he is also on the board of the Circle Voluntary Housing Association and has been since 2003 – only ever missing one meeting in over 15 years. It was a long journey up to that point. Hailing from Bailieborough in Cavan, Fr Patsy was one of 10 children. His father died in his late 30s but the family managed to keep the family business running with many of the children chipping in to help. Fr Patsy knew from a young age that he wanted to be a priest, saying he wasn’t sure why at the time, but he “hasn’t changed his mind since”. He first came into contact with the Oblates in school and after finishing the Leaving Cert in 1956 he went to the Oblates in Ardagh, Limerick and spent one year there. He returned to Dublin to study philosophy for two years and spent four years studying theology in Kilkenny. An avid GAA fan, he used to play for Cavan during the years he was studying, which technically wasn’t allowed. “I was a reasonably good footballer and I played in the Ulster final in 1960 for Cavan against Down when I wasn’t really supposed to be playing at that level. I got into a bit of difficulty over it,” he says. After that final he stopped playing at inter-county level. After Fr Patsy was ordained in 1963 he did another year of study in Inchicore before being sent to Norris Green in Liverpool for five years where he served as a youth leader. The priest who had helped him out of trouble, Fr Paddy, had been posted in London and bought an old nursing home in view of setting it up as a hostel for over 100 Irish men in 1972. Fr Patsy was soon to follow and help, and spent six months looking up how to manage it. Receiving funding from the British government they began building new developments to help people who were homeless, out of work, struggling with addiction and more. Between 1978 and 1990 he served as a parish priest in Bristol and Essex before returning to the housing issue and helping many Irish people who had travelled to Britain for work and subsequently lived in poverty. Returning to Ireland in 1997 he was involved in rebuilding what is now known as the Oblate Hall in Inchicore which has become hugely important to the community with a basketball hall, gym, crèche, afterschool, drug rehabilitation centre and more. Regarding his work with Circle Voluntary Housing Association he says they have in the last couple of months bought 11 apartments in Enniscorthy, 32 in Arklow and 40 houses in Waterford City. They’ve also bought a site in Clondalkin for 19 apartments, and a site in Santry as well. The group is about to start building 52 apartments on Railway Street in North City Dublin and 53 apartments in Inchicore. Fr Patsy says over the years the Government has shown “no real commitment” to tackle the issues, adding “they took away house building from the council and left it to the property developers and it just hasn’t worked”. Despite a move away from religion in modern Ireland he says: “People are still very good, so generous, so prepared to give their time. The religion that they were brought up to understand wasn’t really following Christ, it was about following rules and regulations. “To me anybody who does good is following Christ, goodness is godliness. People are still very good, even though they may not be going to Church, they still have a wonderful attitude. “I see myself in a position as a priest to be able to contribute to something to help people,” he adds. This article, written by Chai Brady, was originally published in the Irish Catholic Newspaper.